Every foodservice establishment needs ice machines. Restaurants, bars, hotels, cafeterias, healthcare facilities, and even gyms and sports facilities all have one thing in common. They need ice to deliver excellent products and services to their customers. Whether you’re blending iced drinks at a bar, serving fresh seafood at a buffet, or offering ice baths at a fitness center, you need to have the right means to produce all the ice you need to run a successful business. And since ice is considered food by the FDA, the ice you use for your establishment must meet all health and sanitation requirements to ensure that you are serving safe, clean, and sanitary ice for everyone. This means choosing ice machines that not only meet regulatory requirements but can also provide the amount of ice you need every day. In this buying guide, we’re going to discuss the different types of ice machines, the features you should be looking for, and some tips to help you choose the right ice machine and accessories to fit your needs. For a wide array of ice machines, check out CKitchen’s full selection of commercial ice makers here. All the different types of ice machines use the same basic process to produce ice. They need a compressor, a condenser, and an evaporator. A refrigerant, a gas known for its capability to transfer heat, passes through a compressor. Here, the pressure and temperature of the refrigerant are raised. The compressed gas then goes through the condenser, where it is converted into a liquid. The liquid refrigerant than enters the evaporator, a chamber where heat from the refrigerant is released and the refrigerant turns back into gas. This is where the cooling takes place to allow the rapid formation of ice. Clean water is then pumped through a water line to the ice trays. The water is poured over the trays so that the ice freezes in layers, giving them a nice, clear appearance that are rarely seen in homemade ice. 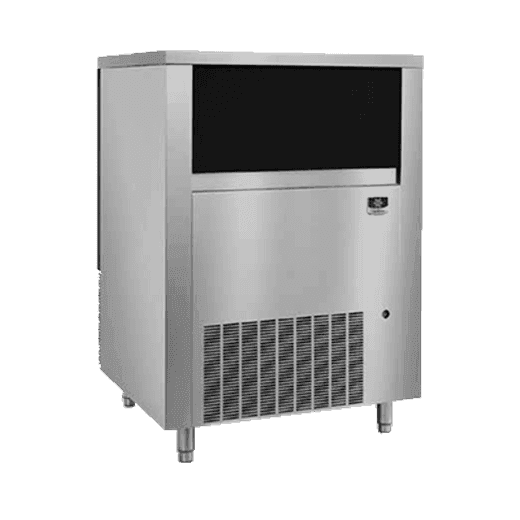 Modular ice machines are cabinets that come with all the components needed to make ice, including the compressor, condenser, evaporator, and water pump. These do not include storage space for the ice they produce so they need to be mounted on a separate piece of equipment that can store or dispense ice, such as an ice bin or dispenser. 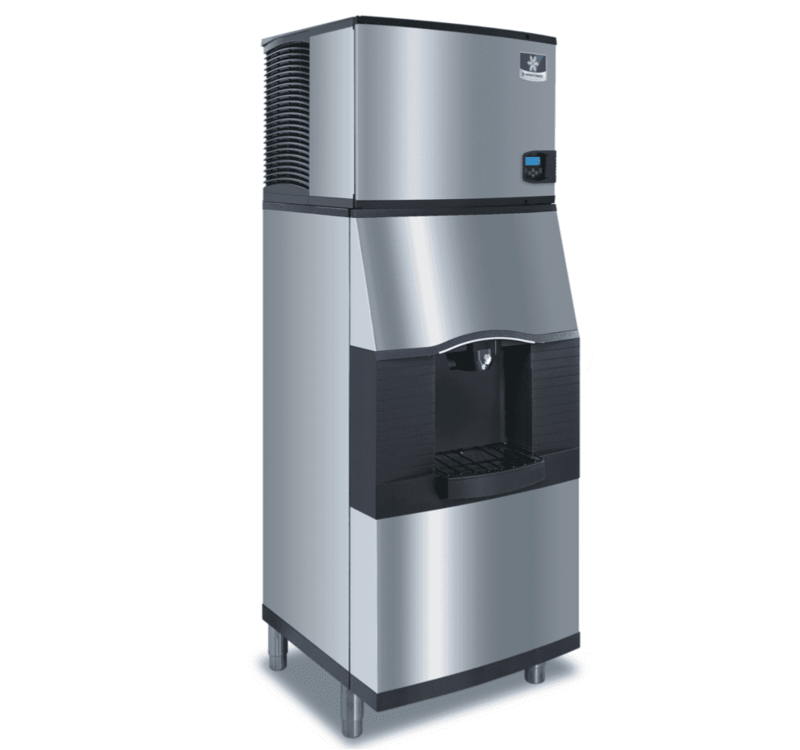 Modular ice machines can also be linked directly with soda and beverage dispensers. 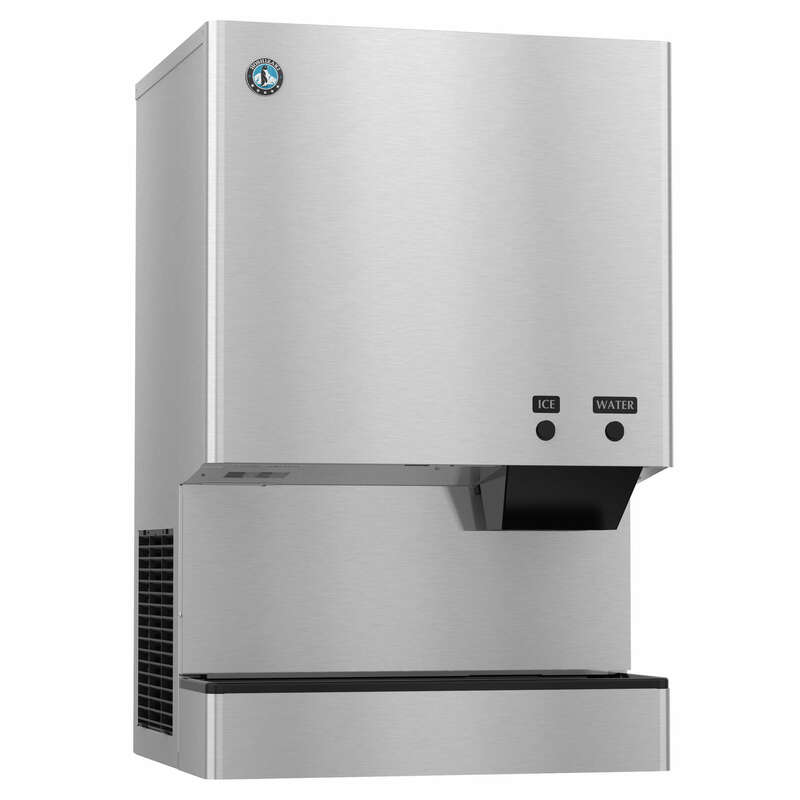 Most modular ice machines run anywhere from 22” to 48” in width. Their size allows them to produce large amounts of ice to meet most commercial applications. The smallest units can produce around 250 lbs. of ice while the biggest models have larger volume outputs of 1,000 lbs. and up. Because modular ice machines don’t come with a built-in bin or dispenser, they can easily be combined with different storage options. They are a great choice for establishments that already have their own bin or dispenser. 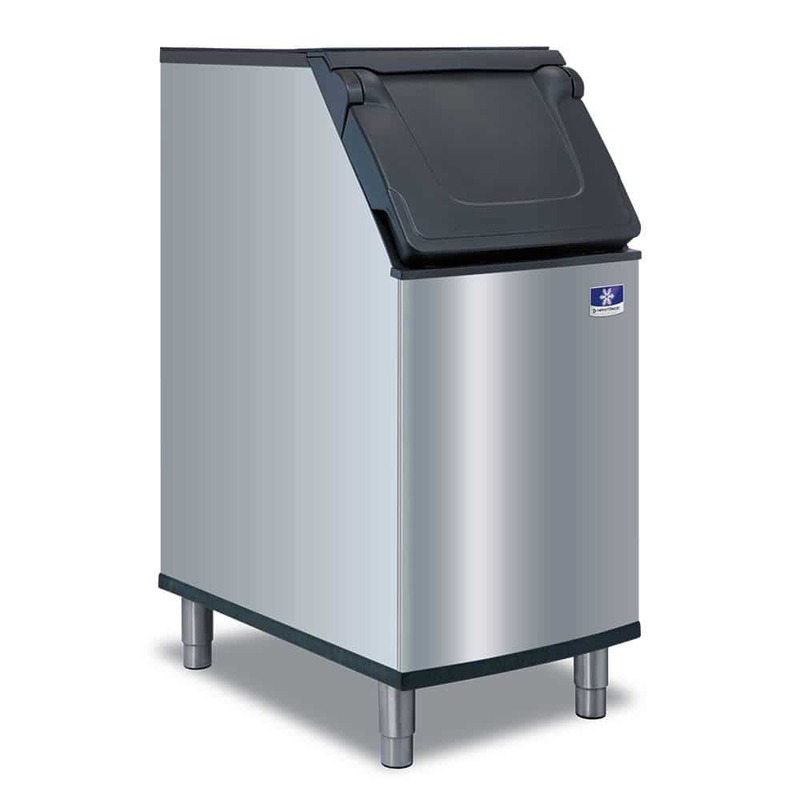 In case your old modular ice machine dies out but the existing bin or dispenser is still working properly, it is easier and less costly to replace the ice machine because you can keep the bin or dispenser you already have. 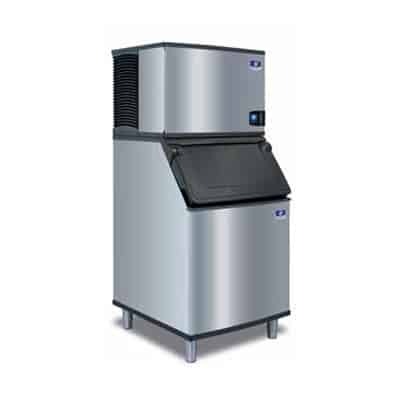 Undercounter ice machines are usually self-contained units. They combine the ice-making components as well as the storage solutions into a single, compact cabinet that can be stored under counters that measure 40” tall. These small ice machines are designed for small bars, cafes, and restaurants that don’t need a lot of ice. Their size allows them to take up much less floor space than modular ice machines. In exchange for the space-saving qualities, undercounter ice machines typically produce much less ice than their bigger countertops. Most models usually have a volume output of 350 lbs. of ice per day, with premium units normally producing slightly larger volumes at higher prices. 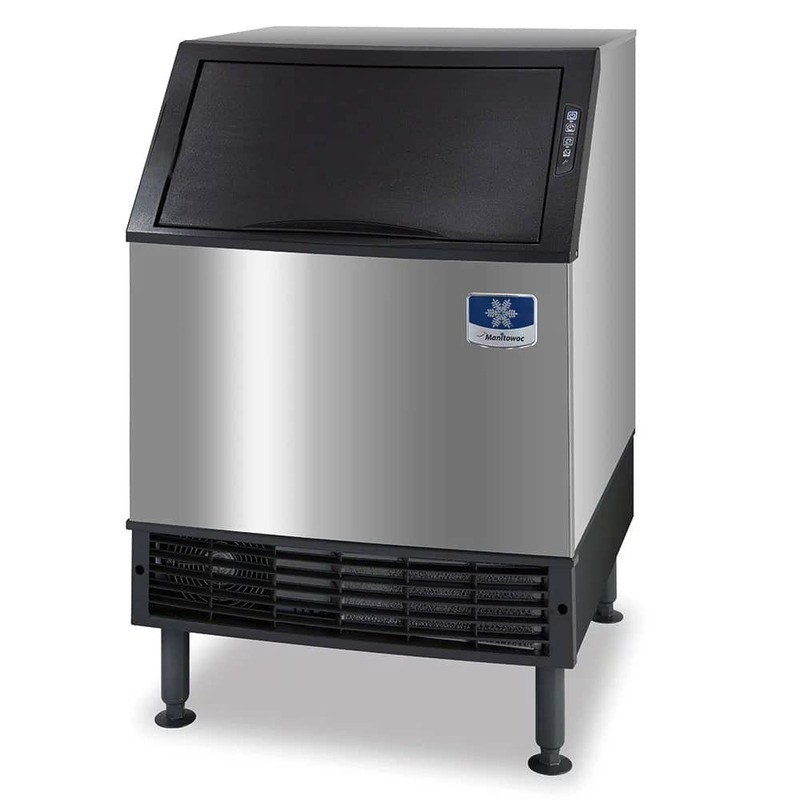 Like undercounter ice machines, these typically self-contained units come with all the ice-making components in one cabinet and a small internal bin for storing produced ice. Some models even include a water dispenser feature. However, what sets them apart from undercounter models is the ice dispensing feature. Normally, these ice machines have a lever or a button that allows you to dispense ice through an ice chute and straight into a glass of beverage. This feature provides a clean and sanitary way to dispense the ice so that employees and customers don’t have to get in contact with the ice itself. Some high-end units even have optical sensors that can sense when a container is waiting for ice to be dispensed. Combined ice maker and dispenser units are perfect for self-service foodservice establishments, such as fast-food restaurants and convenience stores, because there is no risk of contamination. These ice machines are small and compact, allowing them to be mounted on countertops. Their size allows them to produce up to 400 lbs. of ice every day, making them ideal for establishments that don’t have to produce a lot of ice daily, such as small cafeterias and office break rooms. They are also often used in healthcare applications because of their ability to produce chewable types of ice such as nugget ice and flake ice. Some models can also dispense water so that end-users have to use only one piece of equipment to get themselves a glass of ice-cold water. The ice machine’s condenser is used to draw heat away from the unit and turn the compressed refrigerant into liquid form. 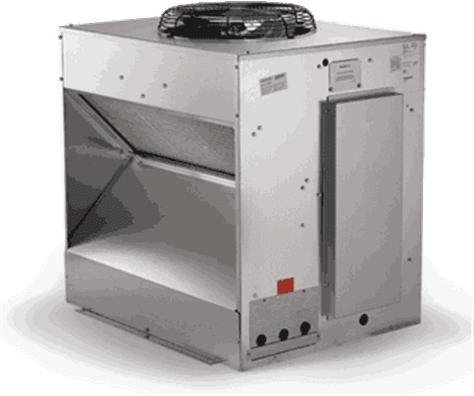 Condensers traditionally come in three types: air-cooled, water-cooled, and remote-cooled. 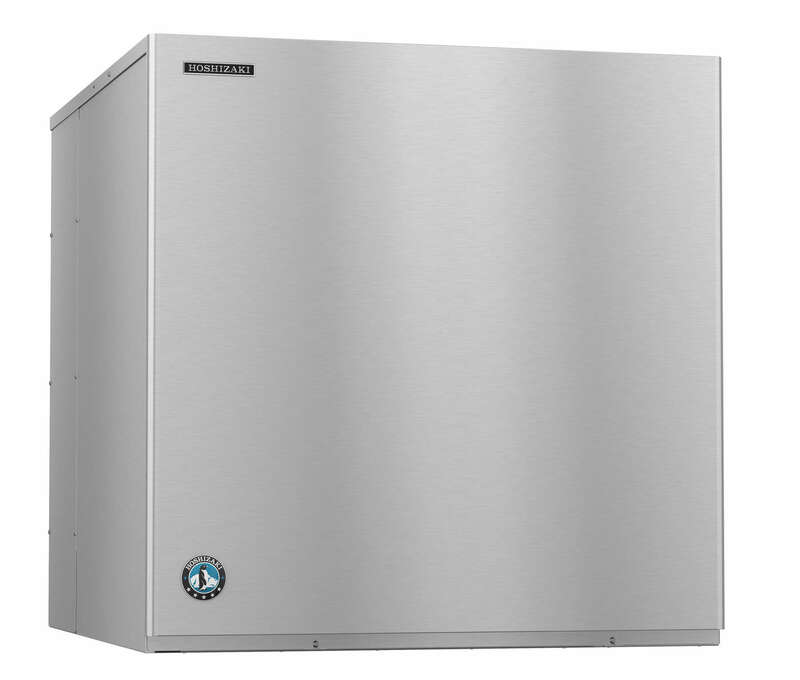 When shopping for ice machines, you need to know the advantages and disadvantages that each of these condenser types bring so that you know which one to buy to your foodservice establishment. Air-cooled condensers are usually the most cost-effective, provided they are used in cool, well-ventilated environments. They don’t require as much water as water-cooled condensers and can, therefore, reduce your water consumption costs. There are also few issues with installation since most ice machines with an air-cooled condenser come with a plug-and-play configuration. Air-cooled condensers work by using fans and vents in the ice machine to draw in circulating air from its surroundings to cool down the hot condenser coils that contain the compressed refrigerant. The heat is then drawn away from the unit and transferred into the circulating air. This kind of setup can make an already hot commercial kitchen even hotter with all the extra heat being drawn into the air. Your kitchen needs good-quality air circulation or an air-conditioning system if you’re planning to invest in ice machines with air-cooled condensers. If the circulating air is too hot, the condenser will draw in hot air from its surroundings to try and cool the condenser. This makes it work harder and take longer to cool, eventually causing stress on the ice machine. Air-cooled condensers in warm environments will also vent hotter air, contributing to a potentially uncomfortable working environment for your staff. 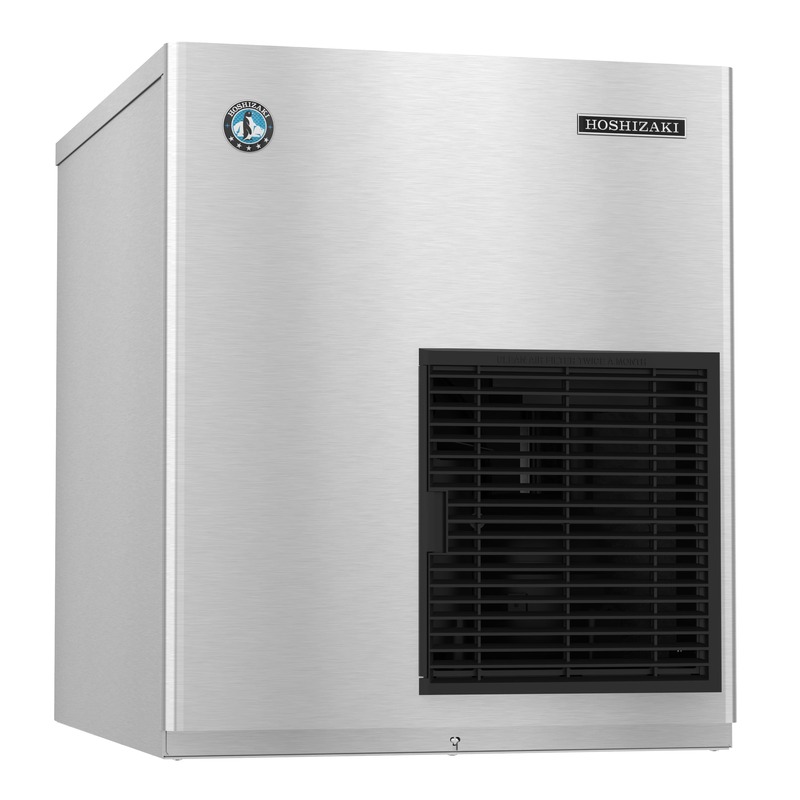 Keep in mind that ice machines with air-cooled condensers require at least 6” of clearance for the top, sides, and back to provide space for the air to circulate. Water-cooled condensers use a separate supply line of water to cool the condenser. Water is used to transfer heat from the condenser coils and efficiently cool the refrigerant, producing hot water that is then drained out of the system. These are often used in hot, humid areas where ambient temperatures go higher than 80° F because they don’t vent hot air into your kitchen. They also keep air-conditioning costs down since they don’t need to pull in cool circulating air from their surroundings. Water-cooled condensers are also preferred in kitchens that have poor air circulation or don’t have enough clearance space for the air to flow through. Facilities that contain high levels of grease and other contaminants in the air will also benefit more from using water-cooled condensers. However, water-cooled condensers have a few serious downsides. While these condensers use far less electricity than air-cooled condensers, they also use far more water than other types of condensers. A 100-lb. output production of ice requires an extra 200 gallons of water, separate from the water that is needed to make the ice. So, for example, if you need to make 500 lbs. of ice every day, you will have to use around 80 to 90 gallons of water to make the ice and an additional 500 gallons to cool the condenser. Water-cooled condensers are not exactly eco-friendly, especially in areas with water shortage and high water costs. In fact, some states and cities prohibit the use of water-cooled condensers because of the excessive amounts of water they need. Some governments offer incentives for businesses to purchase units with air-cooled condensers instead. ENERGY STAR also doesn’t put its seal of approval on equipment that use water-cooled condensers because of their negative impact on the environment. Remote-cooled condensers are air-cooled condensers that are mounted outdoors, far away from where the ice machine is placed. Most remote-cooled condensers are mounted on the roof, where circulating air at the rooftop is used to cool the condenser. These condensers require additional refrigerant lines to connect the ice machine cabinet to the condenser. Most manufacturers offer up to 75 feet of tubing. These condensers require professional installation services that add up to your upfront costs. For their higher price, remote-cooled condensers combine the cooling power of water-cooled condensers and the energy and water savings of the air-cooled condenser. They are also much quieter since the condenser is located away from the kitchen space. Remote-cooled condensers also don’t need additional air-conditioning systems to function properly. Remote-cooled condensers are a good option for establishments in warm areas or in water-restricted places. They are also ideal for public places, such as hotel floor vending areas and grocery stores. Modular ice machines don’t have a storage space for the ice. If you don’t already have an ice bin, you need to invest in one or a few units so you have a place to store the ice until its ready to be used. Ice bins come in varying sizes that can accommodate anywhere from 250 lbs. to 1,650 lbs. of ice at a time. They also come in different widths to match the width of the modular ice machine. Choosing an ice bin requires you to know how much ice you need during your busiest times. 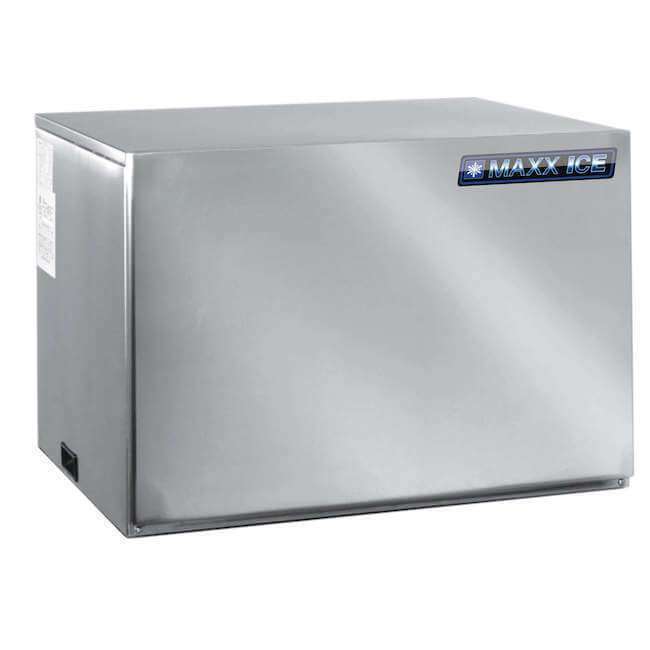 The ice bin you choose doesn’t necessarily have to match the capacity of the ice machine, but it’s recommended that you go for a size that can accommodate around 10% to 20% more than the volume of ice that your ice machine can make. This way, you can produce as much ice as you need during the downtimes and still have enough to use for the peak times without producing too much. If you choose an ice bin that can contain way more than your ice machine’s capacity, you risk having to store unused ice that may grow mold and bacteria because of the excess meltwater. If you choose a smaller ice bin, you risk disrupting your entire kitchen’s operations because you have run out of ice. Some ice bin and ice machine combinations may require the use of a bin adapter. Bin adapters allow you to customize your own configuration to meet your specific needs. For example, you can use ice bin adapters to install one or more small ice machines on a big bin. Or you can use an adapter to mount one brand of ice machine on an ice bin with a different brand. Ice dispensers are different from ice bins because they don’t store ice for longer periods of time. Dispensers are designed to store ice that will be used immediately and dispenses the ice accordingly. Unlike ice bins, they don’t provide extra room for accommodating ice in preparation for rush hours. The largest ice dispenses can typically contain only up to 300 lbs. of ice. Ice dispensers can be self-contained, manual-load or modular. Self-contained ice dispensers are built into the ice machine itself. Ice machines that have their own ice dispensers are more expensive upfront but usually pay for themselves in terms of functionality. Manual-load ice dispensers need staff to manually fill them with ice. These ice dispensers are most useful if you have ice stored in a staff-only area, such as a back-of-house ice bin or a freezer. 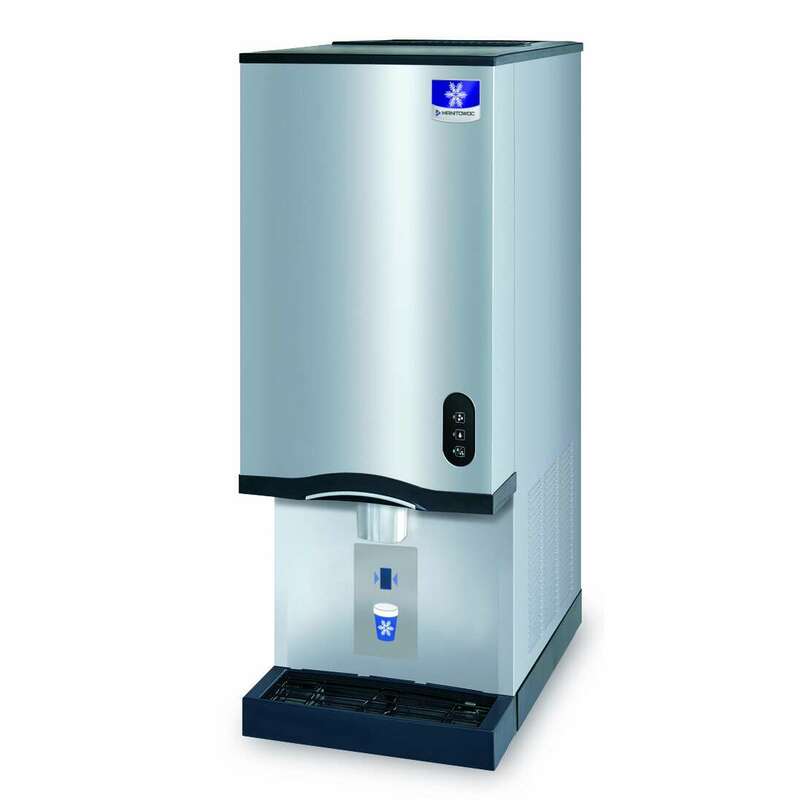 The third type of ice dispenser is the modular dispenser, which is paired with a modular ice machine. Ice dispensers are a sanitary way to provide ice to staff and customers without worrying about getting germs from their hands to the ice. Users can easily pull a lever or push a button and place their container below the ice chute to receive the dispensed ice. Restaurants, hotels, and healthcare facilities can benefit from installing an ice dispenser with their ice machine. Hotel ice dispensers are typically modular units mounted on an ice machine head. These dispensers allow guests to get ice at their convenience without asking for assistance from hotel staff. They can also be used by employees in back-of-house operations for filling large ice buckets or storing large amounts of ice for packing produce. Countertop ice dispensers are more commonly used in nurse stations and healthcare facilities because of their compact size. 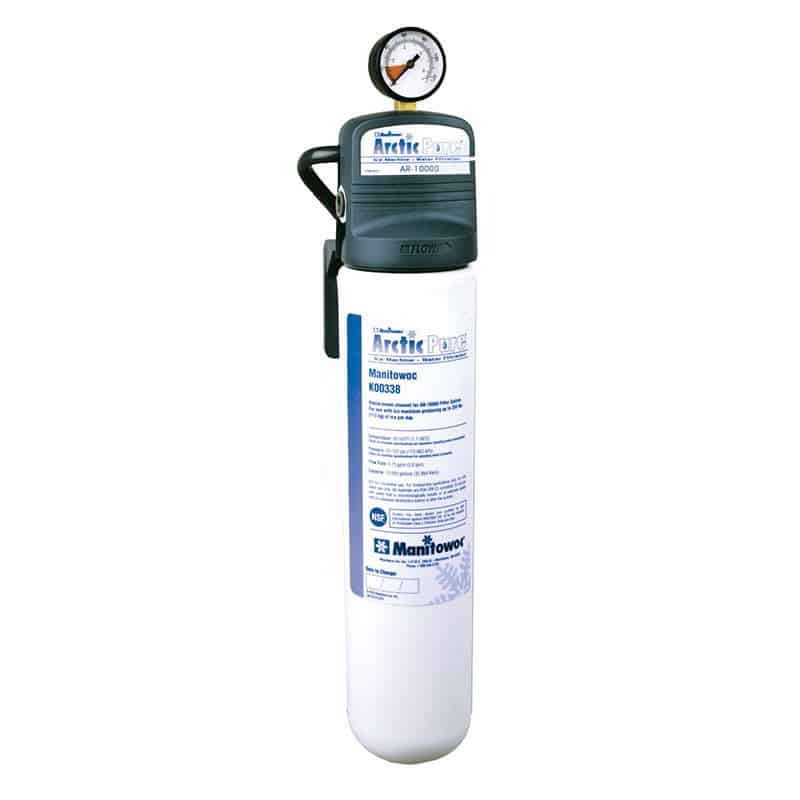 Using a water filter is a must if you’re in an area with poor water quality. A water filter removes lime and scale deposits from the water before it flows into the ice machine to prevent mineral buildup that can disrupt the machine’s operation, reduce energy efficiency, and compromise the safety of the ice that the machine produces. 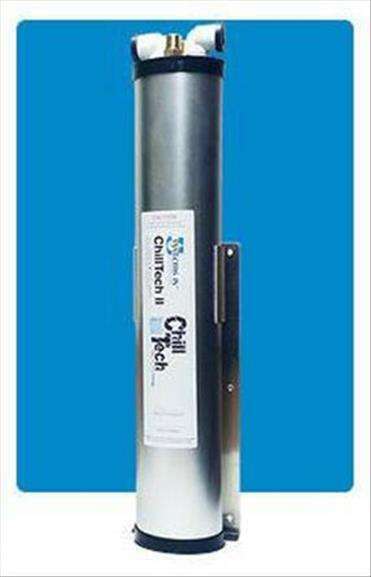 A filter also removes chloramine, a water disinfectant that leaves an unpleasant taste in the ice. If you want to be sure that you’re serving clean and fresh-tasting ice at all times, investing in a water filter is paramount. Also, many manufacturers will void the warranty on your ice machines if you’re using poor-quality water. Therefore, it is important that you feed your ice machines only with high-quality filtered water to keep your warranty intact. 1. Know what types of ice you need to use for your foodservice establishment. Ice comes in different sizes, shapes, and with different melting types. Some types of ice can cool a drink faster while others are more suitable for slow drinking certain cocktails. Some types of ice are better used for displays than cooling drinks while others can add attractive appeal to your concoctions. Knowing the different types of ice you need helps you decide the appropriate ice machine for you. Full cubes measure 7/8” wide x 7/8” tall x 7/8” deep. Also called full dice, full cubes are the most common type of ice used in restaurants, hotels, and bars. They’re also frequently used for bagged ice and dispensed ice for cooling soft drinks and cocktails. Cube ice is made by pumping water over a vertical freezing plate divided by a grid. The first flow of water quickly freezes to form pure ice. The water is then pumped back over the plate to create more layers of ice until entire ice cubes are created and released from the plate through heat or mechanical means. Full cubes melt slowly, thus preserving the full flavor of the drink they are cooling. They also helps reduce customer consumption so that you can save money on ice production in the long run. However, because of their small surface area, full cube ice doesn’t cool as quickly as smaller types. Also known as half dice, half cube ice measures 7/8” wide x 7/8” tall x 3/8” deep. A special type of half cube ice is Hoshizaki’s crescent-shaped ice, which is a half cube with a flat face on one side and a curved face on the other. The size of half cube ice allows them to be packed tightly into a glass while providing quick cooling times for soft drinks and blended drinks. However, half cube ice melts fasters than full cubes. They are not intended for drinks that are meant to be drank slowly, such as a Negroni or a Manhattan. Half cube ice is versatile enough to be used in casual restaurants, quick-service outlets, convenience stores, smoothie bars, and bagged operations. Flake ice is made with water that is sprayed onto the insides of a frozen cylinder. The water freezes to create a thin layer of ice, which is scraped into thin flakes of ice using a spinning auger. The blades force the flakes of ice up and out the top of the cylinder so that the ice falls down the edges like snow. This creates small flakes of ice that can be easily packed and molded in any shape you like. Because of its high ice-to-water ratio, flake ice is light and chewable. It melts quickly and is rarely used for cooling drinks, except for blended drinks and drinks served in healthcare facilities. The softness of flake ice helps healthcare practitioners make sure their patients are well-hydrated without having to worry about ice being a choking hazard. In most foodservice establishments, flake ice is used in salad bars and displays of fresh meats and seafood. Nugget ice comes in a variety of names. Some ice machine manufacturers call it Cubelet, Chewblet, or Pearl Ice. Despite the name differences, they’re all the same thing. Nugget ice are small, irregularly-shaped balls around the size of a marble. These are made like flake ice. However, when the ice flakes reach the top of the cylinder, they are fed through tubes that pack the ice into tiny balls or nuggets. The result is a soft, chewable ice that blends easily into most beverages. There are plenty of benefits to using nugget ice. They have a large surface area that allows them to cool drinks quickly. Also, because nugget ice has plenty of space between the compressed flakes, they easily absorb the flavor of whatever beverage they are cooling. Nugget ice also displaces more liquid than cube ice, allowing you to use less liquid and save more on your ingredient costs. They are also drier than flake ice so they can be served from ice dispensers without the risk of making a mess. Because of these, customers prefer nugget ice over other types of ice. They are perfect for soft drinks and frozen drinks, such as smoothies, frozen coffee, and frozen cocktails. Different manufacturers produce different gourmet ice types. Manitowoc’s gourmet ice machines make a unique octagon-shaped ice while Scotman makes cylindrical ice cubes that look like tiny top hats. Hoshizaki and Koolaire both produce ice cubes, but unlike non-gourmet cubes, these are formed into perfect squares. Ice-o-Matic produces both cylindrical top hats and extra-large ice cubes that measure 1 ¼” wide x 1 1/8” tall x 7/8” deep. Despite the differences in shape, all gourmet ice have the largest ice-to-water ratio, making them the slowest melting type of ice. 2. Determine the size of ice machine you need. To know how big or small of an ice machine you should get, identify the busiest times at your foodservice establishment and figure out how much ice you need during those times. Restaurants are typically most hectic on Thursdays through Saturdays while convenience stores have the most foot traffic from Monday to Friday. The amount of ice your ice machine can produce should be able to match the amount you need during these peak times. These are simply estimates. It is best to look at your specific needs to determine how much ice you need to produce. Once you figure that out, provide an extra 10% to 20% production so that you don’t risk running out in unexpected situations. It’s always better to have a bit of extra ice on hand. Also, consider your seasonal needs and the climate in your area. Obviously, you will need to produce more ice during the summer than in winter. Places where the summers are hotter will also need more ice within a 24-hour cycle. 3. Consider your installation options. Planning out the installation of your new ice machines will make installation easier and less stressful for everyone involved. It also prevents problems and reduces the need for redesigns in the future. There are a few items you need to look into before installing a new ice machine. First, you need to look at how much space you have for a new unit and where you are going to place it. Consider the flow of traffic in your kitchen and provide extra space for accommodating ice bins and dispensers. Remember that ice machines with air-cooled condensers need to be in a well-ventilated space and must have a lot of clearance to vent warm air. All ice machines also require a water line with a shutoff valve. Units with water-cooled condensers need to have two lines. All types of ice machines must also have a nearby drain for draining off excess water. Check your local codes for the specific drain types needed for your ice machine. Lastly, ice machines must be placed close to an electrical outlet. Most models come in standard 110v, although you still need to check the manufacturer’s specs sheet to make sure you have the right voltage. 4. Invest in multiple units. 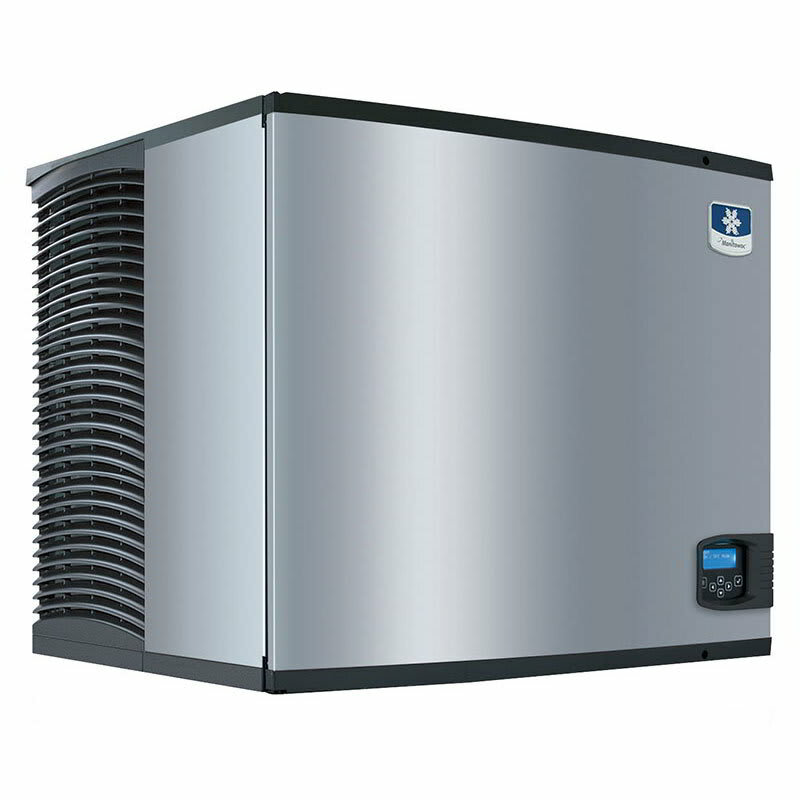 Instead of buying one large ice machine, it may be more beneficial to invest in several smaller units at the same time. Having a single ice machine will have employees constantly rushing to and from the ice bin to the salad bar display, soda dispensers, and underbar ice chests. Not only does this cost time and effort, it only increases the likelihood of cross-contamination. A more ideal setup is to have several small ice machines, with one placed close to the salad bar, another mounted on the soda dispenser, another placed underbar, and so on. This ensures that staff always have ice on hand whenever they need it and they don’t have to run to the ice machine. This is also safer and more sanitary since you don’t run the risk of having various hands reaching into a single ice machine. Also, consider the different types of ice you need. Cube ice and nugget ice, for example, are perfect for cooling drinks but are not ideal for keeping food items cool on the salad bar. Investing in a separate machine that can make flake ice may be a more practical solution. 5. Consider what accessories you need. Certain accessories help make using the ice machine easier. Think about what you’re going to use your ice machines for and look at what accessories make it more convenient. These are essential accessories that all foodservice establishments using ice machines and ice bins are required by health codes to have. 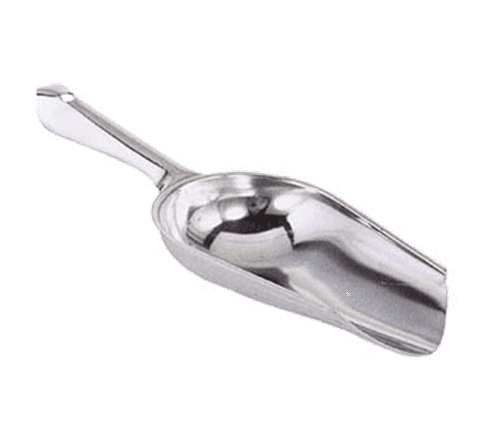 Ice scoops are a hygienic way to scoop the ice into the container you will be serving with. It’s important that you don’t place the ice scoop inside the ice bin itself, which is why having an ice scoop caddy to hold the scoop is important. Ice scoop caddies are typically mounted on the side of the bin. These are used for transporting ice from the bin to other locations in your establishment. It’s recommended to use ice buckets instead of your hands or the container you will be serving ice with. These use the cold wastewater from the ice machine to pre-chill new water that is being pumped into the unit. This makes the machine use less energy and helps you save on your energy bill because the water that flows into the unit is already chilled. These let you fill bags of ice easily by directing ice straight into an ice bag without spilling ice or creating a mess. Ice baggers are useful if you plan on selling bagged ice. Are you looking for premium-quality commercial ice machines? 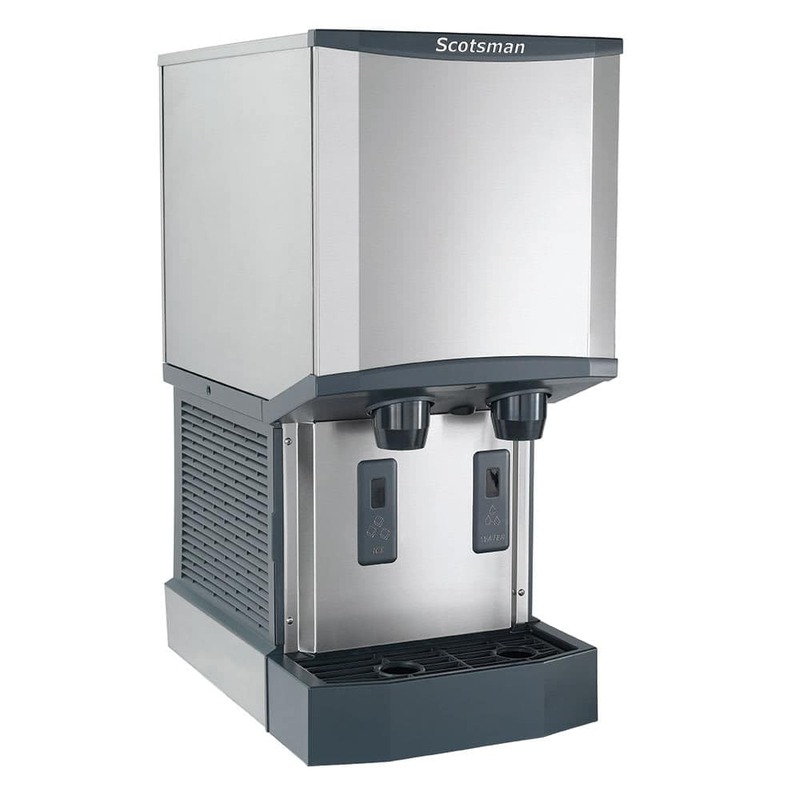 Check out CKitchen’s wide selection of commercial ice machines here.